'Young boy shielded us, braved bullets on his chest’ Hakeem Irfan Srinagar. “Blood-stained bodies were spread all around. I was motionless, pretending as dead so that the troops don’t kill me.” This is how Muhammad Altaf Qureshi recollects the tragic memories of the most bloody military action against protesters Kashmir has ever witnessed since the outbreak of militancy in 1989. Qureshi, 50, was part of the pro-freedom procession on January 21, 1990 but, Qureshi recounts, the moment the procession reached Gow Kadal, a city interior adjacent to Lal Chowk, cops from India’s Central Reserve Police Force showered bullets leaving at least 50 persons dead many more injured. The procession is said to have been provoked by strict curfew and security restrictions. “I was fortunate enough to live up to this day. I think survived by the grace of Allah so that I could tell the story of that black day to my future generations,” says Qureshi.While the incident is locally called ‘Gow Kadal massacre’, Qureshi believes was the “ultimate example of resilience and commitment people had with their aspirations.”He goes on to reminisce thus: “A trooper was showering bullets from a short distance and one of the youngsters in the procession tried to shield the people, taking all the bullets in his chest. It was bravery beyond one’s imagination,” said Qureshi who was then watching bullets coming out of a carbine.According to Qureshi hundreds of people had marched from Jawahar Nagar and Ikhrajpora, raising slogans in favor of Islam, Freedom and Pakistan came out to defy the curfew and campaign for freedom. “However,” he says “participant did not know where to go. There was no set destination. Some were suggesting going straight to the UN office in Sonwar. But the rest were saying the people from the downtown should join so as to make it more impressive. That is why the procession turned towards the downtown via Gow Kadal.”Recalling finer details of the ‘Gow Kadal Massacre’, Qureshi says some of troops were masked and their gestures would suggest that they wanted to take “revenge”. “I still remember that masked face of few of the troopers. I still remember the eyes of a trooper. His eyes were full of fury and revenge. I tried to jump in the river with my Kangri (Earthen firepot) but somehow I couldn’t,” says Qureshi adding, “I preferred to remain with the dead bodies of my neighbours and other participants. I knew for sure I will be shot. In the pool of blood, I closed my eyes and remembered my Allah, recited the Kalima and the face of my three- month-old daughter flashed my mind.”He further recollects, “That scene is still intact in my memories. We all were like sack of flesh and bones without any life. The whole Universe seemed to have frozen for nearly an hour,” says Qureshi in an uncomfortable tone, suggesting the pain even after the two decades. Cops of J&K Police, Qureshi says, lifted him and tried to take him to the other place after an hour but he says, “I still pretended to be seriously injured. But in a swift glance I could see women from a distance peeping through alleys, wailing and pleading the troopers for removing the dead and inured bodies.”“I was taken to a nearby fire station by the Police from where I called up my home where my family was waiting for my corpse after hearing the news of the massacre,” says Qureshi with nearly sobbing tone. According the Qureshi people were told to move towards Maisuma through public address systems with their hands up. Locals in Maisuma had started preparing food, eatables and heating systems for the stranded people as the curfew continued even after the incident.Local photo Journalist Mehrajudin has witnessed the dead bodies in the police control room soon after the ‘Massacre’. He says, “It was a gory scene. Troopers were crossing over the dead bodies probably for recognition. But I broke down into tears. Every body tried to console but to no effect. 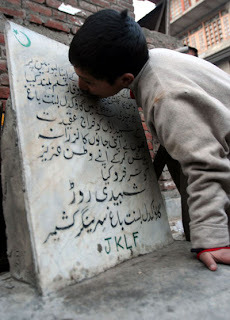 After that no tragedy made me so emotional.”Jammu Kashmir Liberation Front (JKLF) had also erected a plaque in memory of the people who died in the incident. SALUTE TO THE MATYERS OF GAW KADAL . Gow Kadal bloodbath by Jagmohan is an unforgetable tragedy still fresh in our minds. But alas some of our countrymen have a very short memory. How can one not hate India when so many innocent Kashmiris are being slaughtered everyday. Those who ask Kashmiris to look forward and be part of the Indian mainstream have got dyfunctional brains. Never! Never ever shall we forget our marytrs and never! never ever shall we forgive India. Some Ray Lightning has posted some meaningless comment for you Kashmir Crisis on my blog. Thanks for drawing my attention. I have posted my reply to Ray Ligntening's comments on your blog.